When it’s raining outside, it’s great to just sit with your little one and have a day of drawing and making things. Young children love to get the paints and crayons out, and to make their own little art projects with plenty of glue and glitter. It’s a lovely family activity, but a potential disaster for your carpet. While the glue is fresh, scrape away the excess with a blunt knife. Dip a white cloth in white vinegar and apply to the glue stain. Soak the area with warm water and blot using paper towels until the stain disappears. If the glue is dried on, then simply cut it away with scissors. Glue is thick enough to not sink deep into the fibres, so a little trim won’t be noticeable. Remember that the faster you act, the easier it is to tackle any type of spill, and the lower the risk of permanent staining. Of course, it is a lot easier to clean a tiny area of your carpet, so if you’re in need of a thorough carpet cleaning service then you should consider calling a professional cleaning company London. 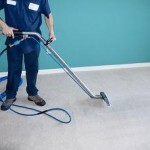 Carpet cleaning London uses state of the art steam carpet cleaners and non-toxic cleaning products to extract dirt embedded deep in the fibres. If you have any questions about carpet cleaning or if you have any handy cleaning tips you would like to share, then please feel free to leave them in a comment.